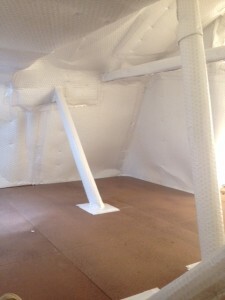 Dust Proof Attic – Perth. Why hire a storage unit when you have an unused storage area in your own home! The attic is a perfect place to store rarely used belongings, but it’s often a dusty, dirty and potentially dangerous place. Until now! BlueSky installations can convert your attic into a clean, dust free and safe storage area. Our loft conversions take care of everything; boarding the floor, moving any electrical cables, installing lighting, and dust-proofing the space. Call us to arrange a free on-site inspection and quotation.